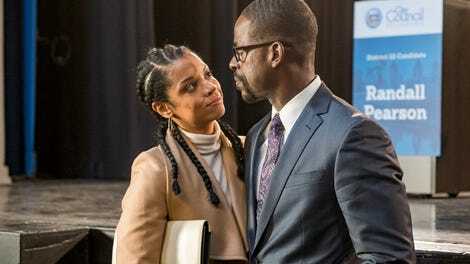 “The thing about documentaries is you can’t force them to end the way you want them too.” That’s just one of the many winking lines in tonight’s This Is Us fall finale, all of which are meant to warn viewers that the show’s ongoing mysteries might not resolve the way we’re expecting. (Other meta moments include Kevin all but acknowledging he’s in a twisty-turny TV show and Zoe pointing out it’s just the fall finale, not the season one.) So while “The Beginning Is The End Is The Beginning” doesn’t deliver any answers about who the Mystery Village Woman is (and might officially pivot away from that mystery entirely), it does offer another game-changing reveal instead: Future Beth is a ballet teacher! Okay, there are arguably some bigger twists than Beth’s unexpected career path. (But, really, who saw that coming?) In fact, the last five minutes of this episode are packed full of reveals. The mysterious “her” of the flash-forward timeline turns out to be Rebecca, which is actually a pretty logical and straightforward answer to that mystery. Kate and Toby are having a boy, who I have to imagine will end up being named after Jack. 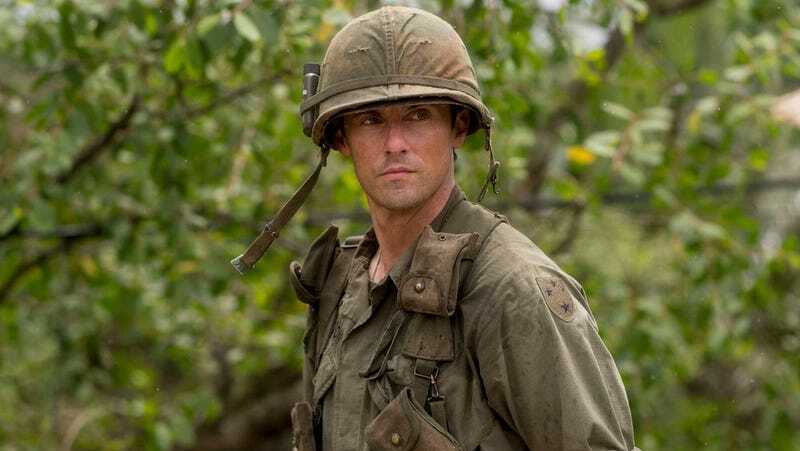 And just as the episode would seem to answer the question of how Nicky died in Vietnam, This Is Us instead offers the massive twist that he didn’t die in Vietnam at all. In fact, he (maybe?) faked his own death and is still alive in the present day! It’s a massive shift, although one that’s perhaps not quite as unexpected as This Is Us thinks it is, given how often I’ve seen it speculated about in the comments. Still, there’s no doubt it’s a huge game-changer, one that has the potential to break the show if it’s not handled correctly. But that’s for later episodes to figure out. Though it’s hard to talk about anything but those final twists, we’ve got a whole fall finale to analyze too. I’ll admit, I found “The Beginning Is The End Is The Beginning” to be a frustrating episode to watch at times, but in different ways than weaker third season episodes like “A Philadelphia Story” and “Toby.” Whereas those episodes were scattered and lacking in finesse, “The Beginning Is The End Is The Beginning” is stronger in execution. It’s well paced, well directed, supremely well acted, and—at its best—filled with the kind of low-key but emotionally felt scenes that have elevated the best episodes of the season. Yet it’s also an episode that demonstrates the wide gulf between the strongest storylines of the season (the Vietnam War stuff, Kevin and Zoe’s trip, Tess’ coming out) and the weakest ones (Randall’s political storyline, Kate’s scattered arc). On their Blank Check podcast, hosts Griffin Newman and David Sims use the term “sweaty” to describe clunky storytelling that awkwardly shoehorns in plot points, and “The Beginning Is The End Is The Beginning” is a really, really sweaty episode. Just take the way Kevin and Zoe’s Vietnamese host (Phong Le) reveals that Nicky isn’t listed on the database for the Vietnam Veterans Memorial. First of all, it’s bizarre that he thought to double check Kevin’s story about his uncle dying in Vietnam. Second of all, it’s weird how he assumes that Nicky not being on the memorial is ironclad proof that Nicky didn’t die in the war, as if clerical errors can’t be made. (And if Nicky faked his death/Jack assumed he was dead, why wouldn’t he be listed on the memorial, anyway?) The bigger problem is that the scene itself is just awkwardly written, and stretched out for the sake of drama rather than capturing a realistic way people might actually speak to each other. That storytelling sweatiness is even more apparent in Kate and Randall’s storylines. Kate’s arc is about her coming to terms with her anxiety over her pregnancy while also finding a new direction for her life, yet the episode explores that in an unnecessarily convoluted way. Her doctor tells her that being an Adele-o-gram requires too much time spent sitting in the car (okay? ), so she tries to get a job as a high school chorus teacher (sure? ), and then it becomes a story about how she needs to finally get her college degree to close a loop in her life (I guess?). To be honest, given that money clearly isn’t an issue, it mostly just seems like Kate needs a hobby, not a new job. But at least I can vaguely see what the episode is striving for in her storyline, even if it takes a really roundabout way to get there. On the other hand, I remain utterly baffled by what Randall’s storyline is even trying to say. In the end, it seems to boil down to a conflict between Randall’s dedication to William’s old community (despite the fact that he’s too far down in the polls to actually win the City Council seat) and his duty to Beth/their kids. But not only does that not really jive with the family-minded Randall of season two, “The Beginning Is The End Is The Beginning” once again takes a needlessly circuitous path to get there. Though last week’s episode ended with Randall and Beth headed towards a big fight over his comment about only taking her political advice because she’s his wife, this episode opens with that conflict having been entirely resolved off-screen. Then it creates a whole new conflict in order to take us back to the point of Randall and Beth being at odds with each other. It doesn’t help that all the logistical concerns I detailed back in my review of “Kamsahamnida” once again apply here. Randall’s “Vote for me and I will fix every problem without ever having to compromise!” seems like a pretty fanciful sales pitch from a guy who admits he doesn’t even know how politics works. And I still can’t figure out if I’m supposed to see Sol Brown as a bad guy or not. It’s perhaps not a good sign that I was actively rooting for him to counter Randall’s moving debate speech by pointing out that it’s pretty hard to personally shovel your constituents’ snowy sidewalks when you live in an entirely different state. Yet for all my gripes about “The Beginning Is The End Is The Beginning,” there’s some stuff in it that really, really works too. For one thing, Eris Baker turns in the standout performance of the episode as she navigates Tess’ tentative coming out storyline. Having been asked to do little more than just be a cute kid for the past two seasons, it’s genuinely exhilarating to watch Baker step up to the plate as confidently as she does here. And I absolutely love the way this episode shades in Tess and Rebecca’s relationship, which doubles as a reminder of how many character pairings This Is Us has left to explore in its main cast. The episode’s two best scenes—Rebecca and Tess’ post-debate heart-to-heart and Kevin’s meeting with the local historian (Joseph Hieu) who grew up in the Vietnamese fishing village—touch on the same idea: Older generations often quietly bear burdens they hope to shield from future ones. Some do that secretly, like the way Jack and the historian’s father both put on a happy face to hide the horrors of war from their children. Others do it more directly, such as the way Rebecca opens up to Tess about the fact that bottling up fears and secrets can manifest in a lot of physical and emotional pain. Both scenes capture This Is Us at its low-key, empathetic best, as does all the really compelling stuff between Jack and Nicky in this episode. So it’s more than a little concerning that the twist ending seems to move This Is Us into full-on soap opera territory. If I’m honest, it’s hard to imagine this Nicky twist resolving in a way that doesn’t feel way too over-the-top. On the other hand, I’d be more than happy to be proven wrong. Given how all over the place this season has been in terms of quality, I guess anything’s possible. Let’s just hope the show holds off on giving anyone an evil identical twin for a while. The montage of Kevin and Jack walking through the same village in two different timelines was really lovely. Given how often the Vietnam War is explored from an American perspective, I’m really glad this episode gave such an extended scene to a Vietnamese character describing his own family’s experience of the war. Randall helping Annie practice for her spelling bee was maybe the cutest thing I’ve ever seen. On my first viewing, I thought the flashforward seemed to confirm that Randall and Beth were still together in the future, but after rewatching it I suppose they could also just be a particularly amicable divorced couple. In case you’d forgotten this detail, as I had: Pin the Tail on the Donkey is the game the Big Three used to play every year during their joint birthday parties, as seen in the first season episode “Three Sentences.” I’m guessing that means they’re visiting Rebecca on their birthday and recreating those memories for her. And with that, This Is Us is going on holiday break. I’ll see you guys back here on January 15th!